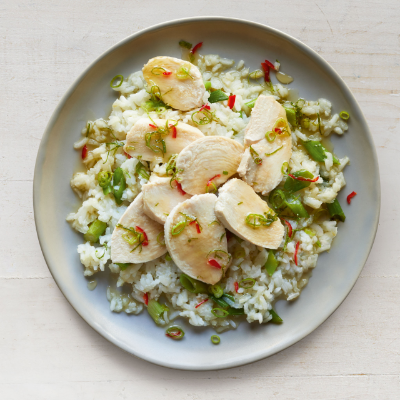 Another Waitrose & Partners Beautifully Simple recipe that is sure to become one you keep coming back to. 1. Combine 1 tbsp of the green salad onions in a small bowl with the chilli, lime zest, juice and honey, then set aside. 2. Place about one third of the remaining salad onions in a medium saucepan, thinly slice the chicken breasts and add to the pan. Pour over 350ml water and season with a little salt. Bring to a simmer, cover and cook for 6-8 minutes until the chicken is thoroughly cooked and there is no pink meat. 3. Remove the chicken from the pan, keep warm and set aside. Stir the rice into the pan of chicken cooking liquid. Cook gently, covered, for about 10 minutes until the rice is tender and the stock absorbed. Add a dash of water if the rice is still firm and cook a little longer. 4. Stir the remaining onions and rice paste into the rice and heat gently, stirring for a couple of minutes to heat through. Pile onto serving plates and top with the chicken fillets. Serve drizzled with the reserved chilli and lime sauce.